HH and I flipped through the TV last week and caught a glimpse of a couple people Barbara Walters considers “most intriguing.” Intriguing is an interesting word. Mandy Patinkin. Actually I know a lot about this actor and have appreciated him for years. But he has also become an outspoken supporter of the Syrian refugees and was spotted by someone (as reported on Facebook last week) helping a Syrian family navigate the NYC subway system. He describes himself as “Jewish with a dash of Buddhist” belief. Larycia Hawkins. Dr. Hawkins is a Christian and an associate professor of political science at Wheaton College in IL. I love Wheaton College. I love that she wore a hijab to show support for Muslim women. I do not love that she was suspended for saying that Christians and Muslims worship the same God. Her dissertation was Framing the Faith-Based Initiative: Black Church Elites and the Black Policy Agenda and I’d like to hear more about that. Pete Docter. The man who taught us it was okay to be sad in Inside Out is a Presbyterian Christian who also wrote Toy Story, WALL-E, and Up. I love it when brilliant, creative people are unafraid to talk about their faith. László Nemes. I’m not sure I can bear to watch his movie Son of Saul, but the interviews about the movie – written and directed by Nemes, who is a Hungarian Jew – make me want to try. Unlike other Holocaust movies, Son of Saul was created not to make us cry but to make us feel like we’ve been hit by a truck. The world can be so unspeakably cruel, sometimes we need to face it and then try to change it. Ani Zonneveld. I first heard Ani speak at the Wild Goose Festival in 2013 representing Muslims for Progressive Values. She is an imam in Los Angeles and her ministry challenges what most Americans have heard about Islam. Check her out. What people of faith intrigue you? 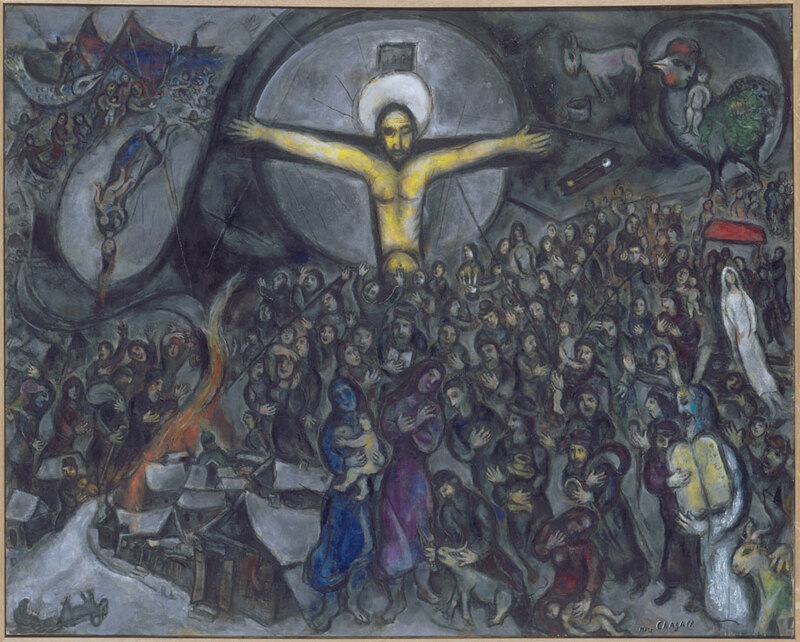 Image by Marc Chagall of the very most intriguing person of faith. I have followed Mandy for many years and have seen his performance several times, in person. Did you see him on Stephen Colbert make a plea for tolerance and acceptance of refugees, especially Syrians.